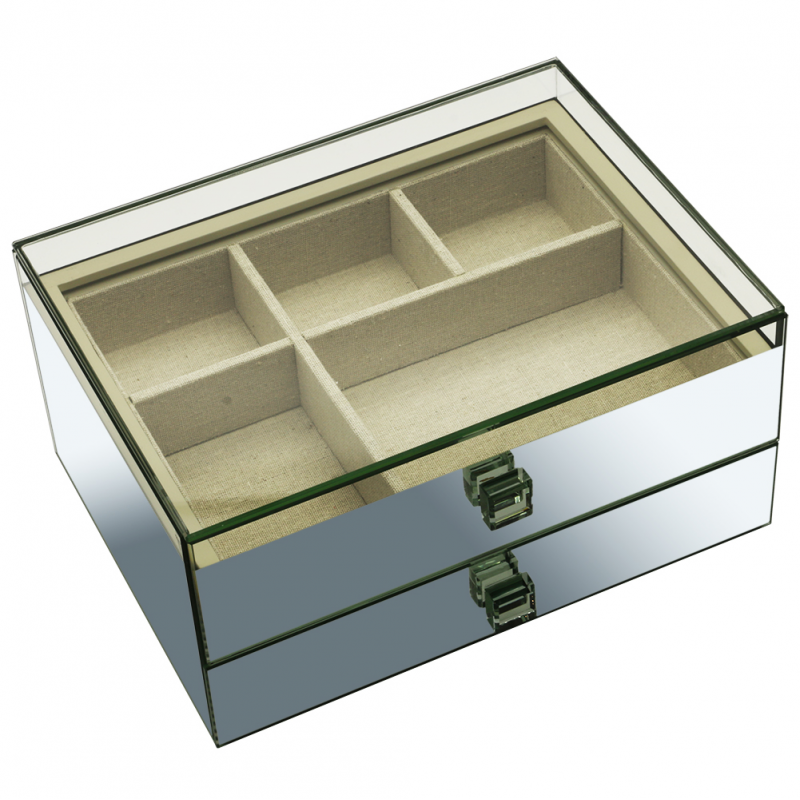 Large mirrored glass jewellery box with a clear glass lid and two pull out drawers with compartments and linen lining. Designed to stack on other trays in the Reflection range. This large lidded glass jewellery box in the By Savvy Reflection range is a beautiful classic box ideal for storing your jewellery and treasured belongings. The box has plenty of room for all your personal items, with two spacious drawers both with our natural linen interior. With the reflection range being one of our most versatile, you can use the large box on top of either of the large trays, on top of pairs of narrow trays or pairs of small rectangular trays giving you endless options for designing your very own glass and linen tower. So beautiful, so classic; the Reflection range is one of our most covetable collections. Special enough to be a wedding gift but affordable enough to treat yourself too, the compartment options in these trays allow you to make the best use of the space within, whatever size you choose. As luxe glass jewellery boxes suitable for both sides of the bed, Reflection trays and drawers will be your favourite way to store your most treasured belongings.